Like horses and water, schools can offer healthy food but they can't force students to eat it. The Food in Schools programme helps to implement a whole-school approach to healthy eating and drinking and to get students on board. 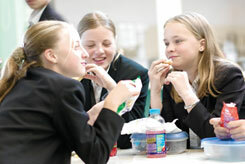 In 2004, a cross section of over 300 secondary and primary schools in England took part in eight pilot projects, part of the Department of Health led strand of the joint Food in Schools Programme. The pilot projects were growing clubs, dining room environment, water provision, and healthier breakfast clubs, cookery clubs, lunch boxes, tuck shops and vending machines. Over 500 students in 40 schools in the North West took part in the pilot cookery clubs, led by a wide range of food enthusiasts from teachers to secretaries to parents. Their primary aim was to increase awareness of nutrition, healthy eating and food safety. Schools found that within the social and experimental environment of the clubs, students were more willing to try healthier, sometimes new, food. Schools also found that the teamwork and responsibility involved in running the clubs improved students' social and interpersonal skills. Students said they gained a feeling of achievement from creating a dish from start to finish. The cookery clubs weren't necessarily run as after-school programmes. Mashuq Hussein, a youth worker based at Edge End High School in Lancashire, helped lead the initiative in his school: a juice bar. The idea arose after Mashuq nagged the first-11 football team about buying fizzy drinks after games. The school bought a fridge, two juicers and two smoothie makers and the football team from Year 11, with Mashuq's support, set up a juice bar which now operates every lunchtime - selling around 50 glasses per day to fellow pupils for 15p. Mashuq says: "The commitment from the lads has been amazing and now they are helping to train up other students to take over the operation. Senior management and the rest of the school have also been very supportive of the project which has really helped to make it work." Sue Dawes, Edge End's assistant head, adds: "It's been a great project to be involved with. The boys have become great role models for the rest of the students, which promotes a positive ethos." Another part of the pilot was improving water provision. Dispensers were installed in 40 schools and individual water bottles were provided to pupils. Teachers were given guides that included 'need-to-know' facts and information, a 'water charter for schools' and posters with information about the benefits of increased water consumption. Preference for drinking water over other drinks rose 1.4 times in secondary schools and consumption of carbonated drinks fell. Some teachers felt the extra water provision contributed to a more settled and productive learning environment, as well as helping to instil good habits. Meanwhile, ten schools in the Yorkshire and Humber region took part in the pilot project to make over their dining rooms and improve the environment for eating. The project aimed to link physical changes to the dining room with educating students about healthy eating. Students, who were involved in decisions about the makeover, were keen to introduce music or television to their dining room to create a café bar feel. Some schools introduced more social round tables, reduced queuing times - or looked into better systems for queuing - and re-decorated to improve the areas. The project found that even low or no cost changes to the physical environment of the school dining area had a major impact on students' eating patterns. Pinder School in Scarborough paired with a local business to give its dining room a full makeover, renaming it Georgio's Bistro after the school's founding father. The school's dining room group, consisting of about 20 students, governors, teachers, the school nurse and non-teaching staff, visited a local business that had recently revamped its own dining room. Managers gave the group presentations about the environment, the attitudes of staff and healthier menus. At the same time the school introduced healthier foods such as salads and fruits and students' parents received statements about what their children had eaten on a weekly basis. Based in a socially and economically deprived area, the school also set up a cashless system to help to increase the take up of school meals. Assistant Head Felicity Davis, said: "The project has been a tremendous success. The dining room is now a hive of activity. You can see students enjoying their lunch in a pleasant surrounding which they themselves have helped to design." While schools will always be up against the chip shop around the corner, these pilots show that given the right incentive, students will choose the healthy option. The Food in Schools toolkit consists of guidance, advice, case studies and templates to help schools create customised solutions. Reference materials, downloadable posters, template questionnaires, booklets and presentations are available on the website.